Tofighi, Z., Ostad, S., Khezrrahdoost, S., Salehizadeh, H., Yassa, N. (2017). Potent anti-nociceptive and anti-inflammatory effects of methanol fraction of Otostegia persica extract and its components. 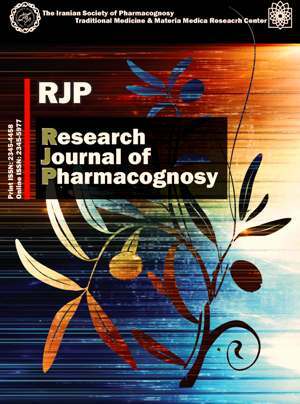 Research Journal of Pharmacognosy, 4(2), 23-29. Z. Tofighi; S.N. Ostad; S. Khezrrahdoost; H. Salehizadeh; N. Yassa. "Potent anti-nociceptive and anti-inflammatory effects of methanol fraction of Otostegia persica extract and its components". Research Journal of Pharmacognosy, 4, 2, 2017, 23-29. Tofighi, Z., Ostad, S., Khezrrahdoost, S., Salehizadeh, H., Yassa, N. (2017). 'Potent anti-nociceptive and anti-inflammatory effects of methanol fraction of Otostegia persica extract and its components', Research Journal of Pharmacognosy, 4(2), pp. 23-29. Tofighi, Z., Ostad, S., Khezrrahdoost, S., Salehizadeh, H., Yassa, N. Potent anti-nociceptive and anti-inflammatory effects of methanol fraction of Otostegia persica extract and its components. Research Journal of Pharmacognosy, 2017; 4(2): 23-29. 1Department of Pharmacognosy, Faculty of Pharmacy and Medicinal Plant Research Center, Tehran University of Medical Sciences, Tehran, Iran. 2Department of Toxicology & Pharmacology and Rational Drug Use Research Center, Faculty of Pharmacy, Tehran University of Medical Sciences, Tehran, Iran. Background and objectives: Otostegia persica (Labiatae) is an endemic plant of Iran and is used for its anti-inflammatory properties in folk medicine of Sistan and Baluchestan province. The aim of the present study was to investigate the anti-nociceptive and anti-inflammatory effects of O. Persica different fractions and identification of the natural compounds from the most active fraction. Methods: Total extract of O. Persica was fractionated with petroleum ether (PE), chloroform (CL), ethyl acetate (EA), n-butanol (BU) and methanol (ME). The analgesic activities of different fractions were determined by formalin test. Then, activity of effective fractions was investigated on carrageenan-induced paw edema assay. Finally, the compounds of effective fraction were isolated and their structures were elucidated. Results: Anti-nociceptive activity of EA and BU fractions (100 mg/kg) and ME fraction (100 and 200 mg/kg) demonstrated significant difference with normal saline during the second phase of the formalin test. ME fraction showed higher analgesic effects in comparison to indomethacin (p<0.05), with IC50 equal to 85.87 mg/kg. Among EA, BU and ME fractions which were selected for anti-inflammatory investigation, EA could not reduce rat paw edema after 6 h. The swelling inhibition percentage of ME was similar to that induced by indomethacin at the same time (p>0.05). Vicenin-2 and isorhamnetin-3-O-glucoside were elucidated from ME as the effective anti-inflammatory fraction. Conclusion: It was concluded that the existence of flavonoids in O. persica extract could play an important role for its anti-nociceptive and anti-inflammatory effects similar to various non-steroidal anti-inflammatory drugs (NSAIDS) and inhibitors of nitric oxide synthase (NOS). Hong YH, Chao WW, Chen ML, Lin BF. Ethyl acetate extracts of alfalfa (Medicago sativa L.) sprouts inhibit lipopolysaccharide-induced inflammation in vitro and in vivo. J Biomed Sci. 2009; 16(1): 64-75. Fujiwara N, Kobayashi K. Macrophages in inflammation. Curr Drug Targets Inflamm Allergy. 2005; 4(3): 281-286. Paterson HM, Murphy TJ, Purcell EJ, Shelley O, Kriynovich SJ, Lien E, Mannick JA, Lederer JA. Injury primes the innate immune system for enhanced toll-like receptor reactivity. J Immunol. 2003; 171(3): 1473-1483. Iwalewa EO, Mc Gaw LJ, Naidoo V, Eloff JN. Inflammation: the foundation of diseases and disorders. A review of phytomedicines of South African origin used to treat pain and inflammatory conditions. Afr J Biotechnol. 2007; 6(25): 2868-2885. Mi J, Seung-Weon J, Somi KCh, Kwang-Seok A, Bum-Keun K, Jong-Chan K. Anti-inflammatory effects of 4 medicinal plant extracts in lipopolysaccharide-induced RAW 264.7 cells. Food Sci Biotechnol. 2013; 22(1): 213-220. Murugesan D, Deviponnuswamy R. Potential anti-inflammatory medicinal plants- a review. Int J Pharm Pharm Sci. 2014; 6(4): 43-49. Kumar S, Bajwa BS, Kuldeep S, Kalia AN. Anti-inflammatory activity of herbal plants: a review. Int J Adv Pharm Biol Chem. 2013; 2(2): 272-281. Recshinger K. Otostegia persica (Labiatae). In: Recshinger K, Ed. Flora Iranica. Graz: Akademische Druck-u, 1982. Sadeghi Z, Akaberi M, Valizadeh J. Otostegia persica (Lamiaceae): a review on its ethnopharmacology, phytochemistry, and pharmacology. Avicenna J Phytomed. 2014; 4(2): 79-88. Safa O, Soltanipoor MA, Rastegar S, Kazemi M, Nourbakhsh Dehkordi Kh, Ghannadi A. An ethnobotanical survey on Hormozgan province, Iran. Avicenna J Phytomed. 2013; 3(1): 64-81. Hajhashemi VA, Rabbani M, Asghari GR, Karami-Saravi Z. Effects of Otostegia persica (Burm.) Boiss. on morphine withdrawal syndrome in mice. Iran J Pharm Res. 2004; 3(3): 171-175. Dubuisson D, Dennis SG. The formalin test: a quantitative study of the analgesic effects of morphine, meperidine, and brain stem stimulation in rats and cats. Pain. 1977; 4(2): 167-174. El-Shenawy SM, Abdel-Salam OM, Baiuomy AR, El-Batran S, Arbid MS. Studies on the anti-inflammatory and anti-nociceptive effects of melatonin in the rat. Pharmacol Res. 2002; 46(3): 235-243. Winter CA, Risley EA, Nuss GW. Carrageenin-induced edema in hind paw of the rat as an assay for anti-inflammatory drugs. Proc Soc Exp Biol Med. 1962; 111(3): 207- 210. Lin Y, Kong L. Studies on the chemical constituents of Desmodium styracifolium (Osbeck) Merr. Asian J Trad Med. 1993; 28(3): 197-201. Lu Y, Yeap Foo L. Flavonoid and phenolic glycosides from Salvia officinalis. Phytochem. 2000; 55(3): 263-267. Tofighi Z, Asgharian P, Goodarzi S, Hadjiakhoondi A, Ostad SN, Yassa N. Potent cytotoxic flavonoids from Iranian Securigera securidaca. Med Chem Res. 2014; 23(4): 1718-1724. Diaz A, Dickenson AH. Blockade of spinal N- and P-type, but not L-type, calcium channels inhibits the excitability of rat dorsal horn neurons produced by subcutaneous formalin inflammation. Pain. 1997; 69(1-2): 93-100. Yerima M, Magaji MG, Yaro AH, Tanko Y, Mohammed MM. Analgesic and anti-inflammatory activities of the methanolic leaves extract of Securinega virosa (Euphorbiaceae). Nigerian J Pharm Sci. 2009; 8(1): 47-53. Rezazadeh Sh, Kebryaeezadeh A, Pirali-Hamedani M, Shafiee A, Gharuni Isfahani S. Anti-inflammatory and analgesic activity of methanolic extracts of aerial parts of Stachys schtschegleevii Sosn. and Stachys balansae Boiss. & Kotschy ex Boiss. in rats. Daru J Pharm Sci. 2005; 13(4): 165-169. Vinegar R, Schreiber W, Hugo R. Biphasic development of carrageenin edema in rats. J Pharmacol Exp Ther. 1969; 166(6): 96-103. Brooks PM, Day RO. Drug therapy: nonsteroidal anti-inflammatory drugs-differences and similarities. New England J Med. 1991; 324(24): 1716-1725. Salvemini D, Wang ZQ, Wyatt PS, Bourdon DM, Marino MH, Manning PT, Currie MG. Nitric oxide: a key mediator in the early and late phase of carrageenan-induced rat paw inflammation. Brit J Pharmacol. 1996; 118(4): 829-838. Nantel F, Denis D, Gordon R, Northey A, Cirino M, Metters KM, Chan CC. Distribution and regulation of cyclooxygenase-2 in carrageenan-induced inflammation. Brit J Pharmacol. 1999; 128(4): 853-859. Handy RLC, Moore PK. A comparison of the effects of L-NAME, 7-NI and L-NIL on carrageenan-induced hind paw edema and NOS activity. Brit J Pharmacol. 1998; 123(6): 1119-1126. Tofighi Z, Alipour F, Hadavinia H, Abdollahi M, Hadjiakhoondi A, Yassa N. Effective antidiabetic and antioxidant fractions of Otostegia persica extract and their constituents. Pharm Biol. 2014; 52(8): 961-966. Yassa N, Sharififar F, Shafiee A. Otostegia persica as a source of natural antioxidants. Pharm Biol. 2005; 43(1): 33-38. Ayatollahi SAM, Kobarfard F, Asgarpanah J, Choudhary MI. Antiglycation activity of Otostegia persica (Burm.) Boiss. Afr J Biotechnol. 2010; 9(24): 3645-3648. Gonzalez R, Ballester I, Lopez-Posadas R, Suarez MD, Zarzuelo A, Martinez-Augustin O, Sanchez de Medina F. Effects of flavonoids and other polyphenols on inflammation. Crit Rev Food Sci Nutr. 2011; 51(4): 331-362. Rathee P, Chaudhary H, Rathee S, Rathee D, Kumar V, Kohli K. Mechanism of action of flavonoids as anti-inflammatory agents: a review. Inflamm Allergy Drug Targets. 2009; 8(3): 229-235. Hamalainen M, Nieminen R, Vuorela P, Heinonen M, Moilanen E. Anti-inflammatory effects of flavonoids: genistein, kaempferol, quercetin, and daidzein inhibit STAT-1 and NF-κB activations, whereas flavone, isorhamnetin, naringenin, and pelargonidin inhibit only NF-κB activation along with their inhibitory effect on iNOS expression and NO production in activated macrophages. Mediators Inflamm. 2007; Article ID 45673. Funakoshi-Tago M, Nakamura K, Tago K, Mashino T, Kasahara T. Anti-inflammatory activity of structurally related flavonoids, apigenin, luteolin and fisetin. Int Immunopharmacol. 2011; 11(9): 1150-1159. Lee JH, Zhou HY, Cho SY, Kim YS, Lee YS, Jeong CS. Anti-inflammatory mechanisms of apigenin: inhibition of cyclooxygenase-2 expression, adhesion of monocytes to human umbilical vein endothelial cells, and expression of cellular adhesion molecules. Arch Pharm Res. 2007; 30(10): 1318-1327. Chirumbolo S. Anti-Inflammatory action of isorhamnetin. Inflammation. 2014; 37(4): 1200-1201.